December 2001 Heat Wave : 30 Cities from Wisconsin to Maine experience record temperatures. Buffalo, New York reports it’s first snowless November, plants are tricked into blooming early by high temps into the 60s. Chicago reports 68°, which is 30° above normal. November 2001 to January 2002 was 4.3 degrees Fahrenheit above average temperatures gathered between 1895 and 2001, the warmest on U.S. record books. November 18-19, 2001 Most intense Leonid meteor storm in 35 years rains thousands of shooting stars over North America, Hawaii and then most of Asia and Australia. The constellation Leo (the Lion), is associated with the Tribe of Judah and is symbolic of the Second Coming of Jesus Christ. Its also interesting to note that the Zodiac begins with Virgo (symbolic of the first Advent of Christ by the Virgin) and ends with Leo (symbolic of the Second Coming of Jesus as the Lion of Judah). However, Astrology is a form of wicked divination and is an abomination to God. The Hebrew word for Lion is Aryeh which is also symbolic of God’s protector of Jerusalem. A Cross of steel beams was discovered in the rubble by Frank Silecchia, a born-again Christian and construction worker at Ground Zero of the World Trade Center disaster site on 9/13/2001. Stories abound of NYC Firefighters dropping to their knees and praying at the sight of the crosses rising from the rubble. 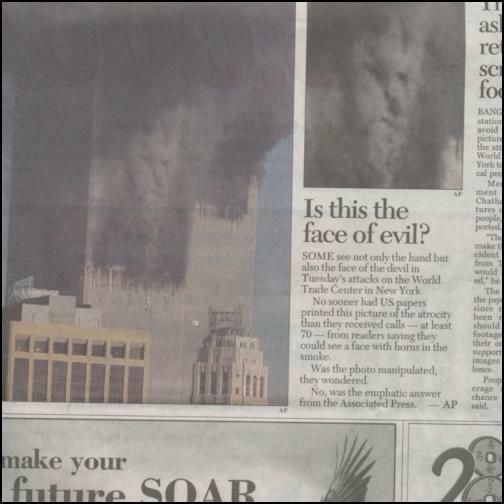 Initially I dismissed this as photo manipulation, until a network news web site included one-page story on what appears to be the face of the devil protruding from the smoke of the World Trade Center on fire in video footage from both CNN and AP News Wire. Click here to see what I mean. March 22, 2001 Shofar blasts at the Western Wall and in yeshivot (Bible Colleges), synagogues and religious schools throughout Israel, announced and celebrated the declaration by the Gedolei Yisrael (Great Ones of Israel) to formally recognize the beginning of the “Time of Jacob’s trouble.” It is significant that though these Rabbis officially and traditionally regard the 7th Biblical month as the ‘New Year’ for the counting of Jewish history, this Declaration of “Jacob’s Trouble” was really done at the dawning of the true Biblical New Year, on the new moon declared by Judaism for 25 March 2001. Many Bible scholars believe this to be the true start of the New Millennium – in fact, the start of the 7th or Sabbatical millennium since Creation. The U.S. is 84.7 percent Christian, compared with 96.4 percent in 1900. It also has the world’s largest Jewish population at 5.6 million (4 million Jews live in Israel), and 4.1 million Muslims and 2.4 million Buddhists. “Unaffiliated Christians,” who profess their faith when polled or retain some belief but aren’t active church members, number 44 million. Millions dabble in the occult. Non-religious and atheistic Americans represent 9.4 percent of the population. The European Union has actually minted a coin and printed a stamp with a “woman who rides a beast”. MouseOver here . On Christmas Day 2000, in North America there was a partial solar eclipse, the sun was hidden for a short time. It started at 3:37pm and ended at 5:13pm in Los Angeles, PST. “Getting Eighty-sixxed” is street slang for getting ‘kicked out’ or ‘getting killed’, so isn’t it ironic that the FDA approved abortion pill is called “RU486” which translates into “Are You For Murder” ? May 5, 2000 will see the first alignment of Mercury, Venus, Mars, Jupiter, Saturn, the Sun and Moon to be seen in 6000 years. As we approach the 2nd millennium (2001 A.D.) China approaches the Year of the Dragon, regarded as time of tumultuous change. The Year of the Dragon lasts from Feb. 4th, 2000 to Feb. 4th 2001 when the Year of the Snake begins. Its interesting that both the dragon and the snake are symbols for the Devil in the Holy Bible. The United States of America used to be a Christian Nation. World Wide Web = WWW = tav tav tav in Hebrew, or 666. Saddam Hussein has spent $1 billion rebuilding the ancient city of Babylon. 1998 was the 70th Jubilee in Jewish history. Orthodox Jews expect their messiah anytime now. St. Malachy prophesied that the next Pope will be the last Pope. Shiite Muslims expect their messiah (the 12th Immam) anytime now. Messianic Jews expect their Messiah to return anytime now. The Jewish Passover Meal or Seder is all about Jesus Christ. Jesus Christ is a Jew! Israel is the only country that was, was not, and is again.